In my quest to find as many different brownie recipes as there are days in the year, I bring to the table these Chocolate and Rye Brownies. This winning combination first came to my attention when I chanced upon a bar of Toasted Rye and Butter Chocolate while on my travels in New Zealand. 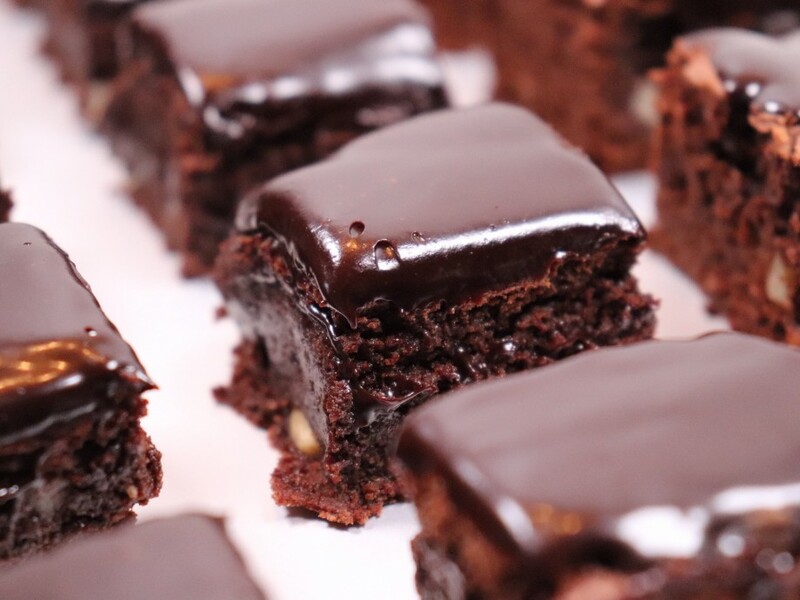 The rye gives the brownie a chewy texture and almost nutty flavour. 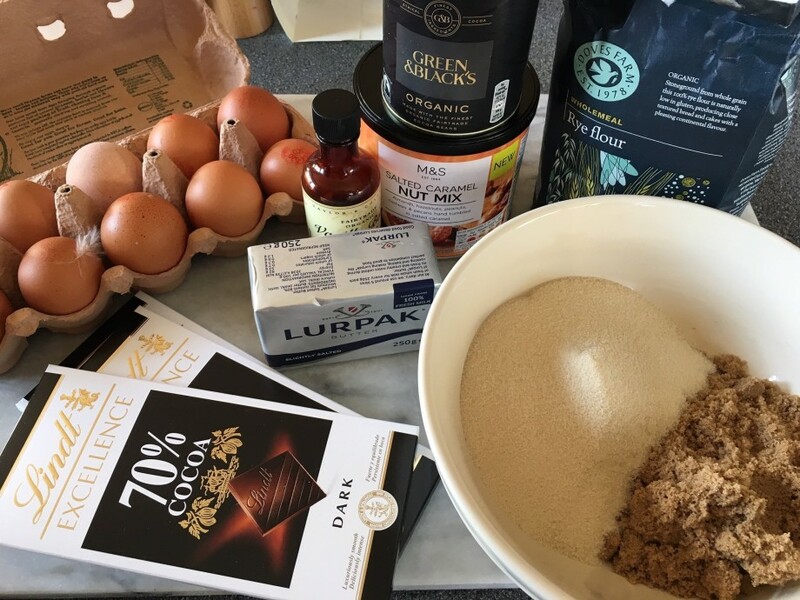 I wish I could say the wholemeal rye nudges the brownies into the healthy food category but I fear the rest of the ingredients cancel out any benefits. No matter, a little of what you fancy does you good. 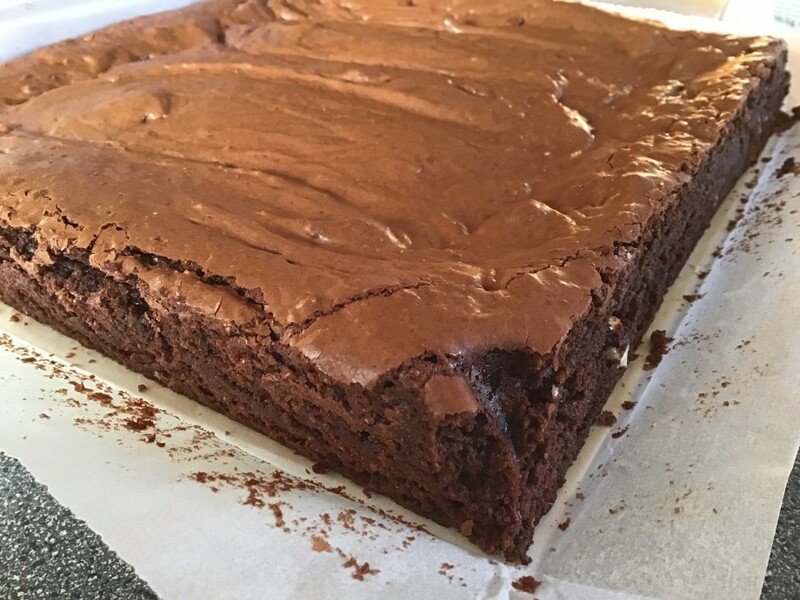 You don’t have to ice the brownies-in fact most of the time it would be de trop -but here the glossy glaze is the perfect finishing touch. Heat the oven to 180˚c, fan oven 160˚c, mark 6. Line a 9 x 9 inch square tin with non-stick baking parchment. Mix the flour, cocoa powder and baking powder in a bowl and set aside. Put the butter and chocolate in a suitable bowl and microwave on high in short bursts, stirring in between, until the mixture is smooth and both the chocolate and butter have melted. Set aside to cool a little. Put both the sugars in a large mixing bowl and add the eggs. Whisk for 6-7 minutes until the mixture is thick and pale. Carefully fold in the melted chocolate and butter. Fold in the flour mixture followed by the nuts. Spoon into the prepared tin and spread out to the edges. Bake in the oven for 18-20 minutes until just firm. Leave the brownies to cool completely. For the icing, put the syrup, sugar, cocoa powder, 40g of the chocolate and 50ml water in a saucepan. Stir over a low heat until the mixture is smooth. Simmer gently for 5 minutes then take off the heat and stir in the remaining chocolate and butter. Stir until smooth and glossy. Pour the icing over the cooled brownies and leave until set, two to three hours. Cut into small squares.